One of my most favorite movies of all times is Raiders of the Lost Ark. Who could ever forget Indiana Jones trekking around the world to find the lost Ark of the Covenant, battling bad guys left and right while taking a beating that would kill just about any mortal person? I’ve bought lots of old tools – especially hand planes – at that flea market and in the other big virtual flea market out there – eBay. Since I have told my family about my interest in old tools, I’ve been getting them by the bushel. Old hand planes, spoke shaves, auger bits – it’s a bonanza of old iron that shows up at my door – whenever someone needs something built! Before you decide to take the plunge, it pays to become familiar with what hand planes are all about. You can check out an excellent primer at Wikipedia (http://en.wikipedia.org/wiki/Hand_plane), or, what I would recommend would be to get to a library and check out Garret Hack’s The Handplane Book. These are both great places to look for the basics. Once you get the old tools, you really want to put them to use as soon as possible. While you could take a rusty old hulk and try to work with it, it pays to do a few things first. 1. Before you buy – or after you receive one as a gift – check the plane out thoroughly. 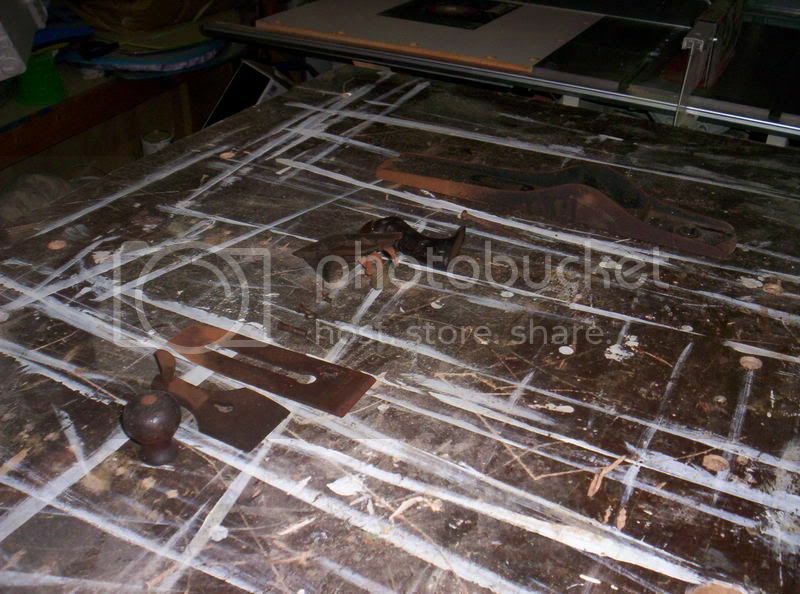 Look for broken totes and knobs (you can buy or make replacements), cracked iron, warps and twists, missing pieces, etc. I’ve received some planes that look like they were used for target practice – needless to say, those babies are probably not going to get put back into service. I typically put the broken planes up on a shelf in my garage for decoration and as sources of spare parts. 2. Once you decide you want to rehab the plane, take the entire thing apart. Remove the handles, cap iron, frog, everything. I usually start with wiping everything down with a rag sprayed with some WD-40 and a blast of compressed air for the nooks and crannies. For screws, use an old toothbrush to get the crud out of the teeth. 3. Some folks become crazy about getting rid of rust. I’ve seen people sandblast their planes, submit them to electrolysis and a bunch of other methods to strip off a layer of rust. For me, I’ve found 400 grit wet/dry paper with a blast of the aforementioned WD-40 can clean up the pieces very nicely. 4. Assemble the tote, knob and frog into the plane body, but hold off on the blade and chip breaker. I usually stick a piece of 320 grit wet/dry paper down to my table saw, lubricate with the WD-40 and rub the sole of the plane until its clean. You’d be surprised how much bright red rust comes off the sole of some of these babies! Keep wiping the crud out of the paper so you can eventually flatten the sole of the plane. 5. And, when it comes to flattening plane soles, don’t make yourself batty about it. An easy way to ensure the sole is flat is to draw a squiggly line with a permanent marker across the sole. 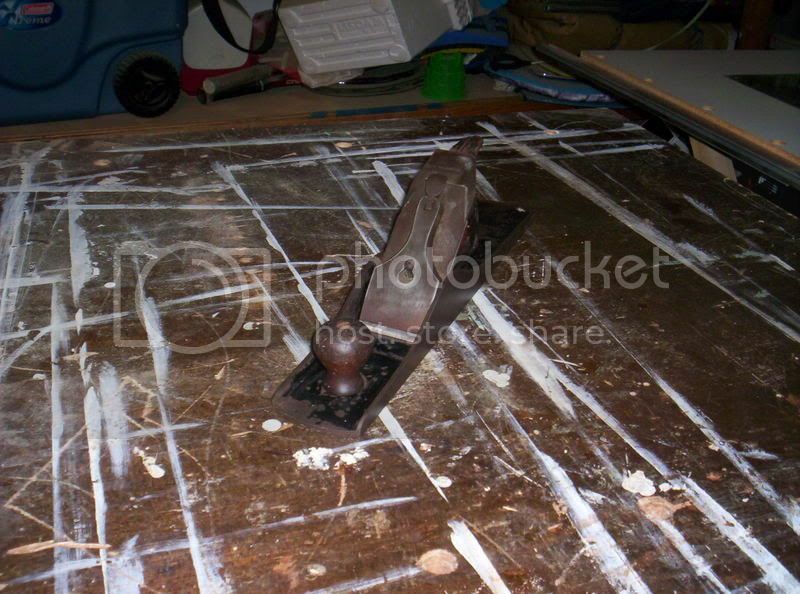 Rub the plane on the sandpaper a dozen strokes, then lift the plane up and look at it. Where is the marker still on the sole? You want to make sure the front and the area around the mouth are nice and flat, so rub the plane until those areas are without marker. 6. Once you have everything nice and shiny, look at the plane iron. Sharpen and hone that sucker. If you can swing it, look to get a replacement plane iron. There are some killer replacement plane irons out there for $25 – $40 from Lee Valley, Lie-Nielsen, Hock tools and others. 7. Assemble the entire plane and give it a good wipe down with some furniture paste wax. That keeps rust at bay and allows the plane to glide nicely across the board. 8. USE THAT PLANE! Give your jointer, planer or random-orbit sander a rest and develop the skills necessary to dress, joint and smooth wood the old fashioned way. You may never give up your power tools, but you will gain valuable insight into how wood works, and just how fortunate you are to have those modern shop tools. Now, there’s something to discover all on your own. My workbench is ugly. It’s REALLY ugly. If ugly were bricks, my bench could build the Great Wall of China. The beast was born one Valentine’s Day night when my wife was working evenings. I was the only guy at Home Depot that night (everyone else had the sense to take their sweeties out for a nice dinner). I cobbled a puny little bench together with some Simpson Strong-Tie connectors, 2×4’s, a half-sheet of ¾” plywood and a fistful of screws. And, it was good. Later, when I discovered that my 2 foot by 4 foot bench top wasn’t going to be large enough to work for me, I scrounged through my neighbor’s garbage after he did some renovation work and found his old wooden entry door. SUPER ugly 1970’s carvings and molding on the outside a dark, chocolate brown paint on the smooth inside panel. I carted that heavy sucker home, removed the small plywood top and screwed the big 36″ x 80″ door in its place. 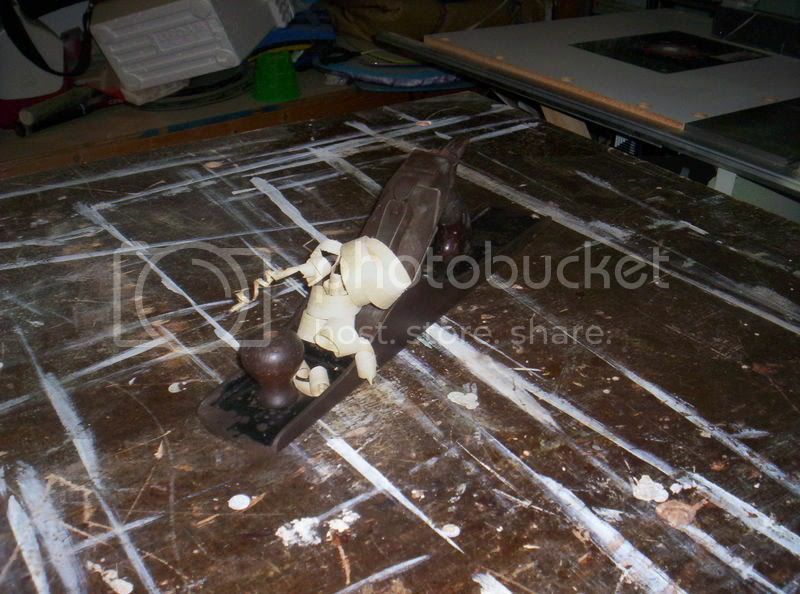 Yes, it has the hinge mortises. And the bore holes for the deadbolt, door knob and security peep-hole. I consider that as part of my shop security plan. Over the years, I have glued up on it, painted on it and tested the sharpness of plane irons on its corners. I’ve pounded on it, screwed jigs to it and (accidentally) cut into it with a circular saw. This thing is a beast! The creature from a nasty corner of the nasty garage. But, it has a beauty all its own, too. That ugly bench of mine is the perfect size for my shop. I have built countless projects on it – from the obscenely large to the dainty and delicate. I can lay a straight edge on the door and verify that yes, it is dead flat – once I scrape the beads of dried glue off of it. I can clamp projects down to the overhanging edges and know that they won’t move when I chisel, cut or plane. It’s the same height as my table saw, and functions as an outfeed table. I’ve added some modifications to my bench to make it even more useful. After using a real, professional woodworking bench with a tail vise, I longed for a better way to clamp projects to my bench top to face plane them. I bought a matched pair of Veritas Bench Pups and Wonder Pups, and drilled a series of ¾” holes through the top. Now, I can plug in the pup, clamp it in place and face plane until my heart’s content. Another awesome upgrade was adding an old Wilton vise to the front of the bench. It’s right there on the left corner. I experimented with several different configurations of where to site the vise, but the classic position for right-handed woodworkers suits me just fine. Edge planing boards is now a snap. 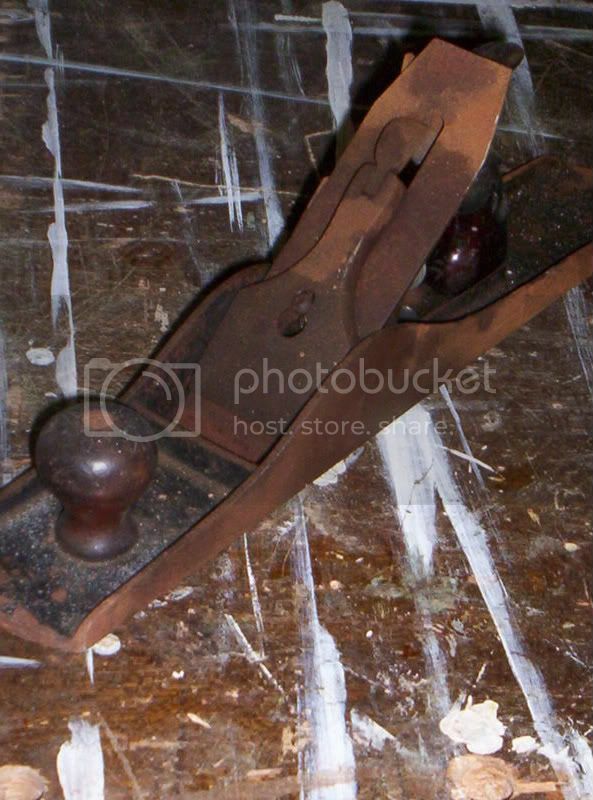 By the way, the vise itself is just as ugly at the bench is rides on. It was plucked from a dumpster behind a school that was doing away with its wood shop program. It must have been built in the 1960’s, coated in a light layer of oxidation and surface rust and has a handle made of a length of metal electrical conduit. I cleaned it up, put some southern yellow pine faces on it and it works like the day it was built. Do I ever want to replace that ugly bench with something new and pretty? Sure I do. I get bench envy from time to time. I was at the American Sycamore Woodworker’s Retreat in Cloverdale, Indiana and saw a beautiful maple workbench with purpleheart inlays. Heavy mortise and tenon joinery. Dual screw tail vise. The thing looks more like an altar for some woodworking religion than a bench. But, it didn’t have the character of mine. You know, I discovered I really am a loyal, sensitive guy.